My weekend was spent in the lovely city of Nashville, known for its country roots, Christian music, and apparently its pancakes (Pancake Pantry is practically idol-worshipped here, but after trying a couple different dishes, I can't say I'd wait an hour for it). But the coffeehouses here seemed numerous. My goal was to hit as many as possible, including the Frothy Monkey, Global Cafe, and a couple others. Sadly, due to the fact that everyone is closed on Sundays, I only got to two places. More oddly, the two I did visit were sister coffeehouses. The next day, I dragged the girlfriend and my two cousins (from the mountains of PA) to find other coffeehouses. We found Bongo Java and Frothy Monkey, but due to time only went to Bongo Java. Bongo is situated across the street from Belmont University and has one of the nicest coffee house layouts I've ever seen. It's in an old house, so it has a lot of room as well as a huge front porch. The decor adds a nice artsy feel to it. I especially liked the serve-yourself, random water tap behind the counter. Both Fido and Bongo Java's coffee were good. They roast their own coffee, the ethiopian harrar I had at Bongo being tasty and smooth. The espresso wasn't half bad either, though I can't say I was amazed. The tea was Numi and the chai I didn't spot. 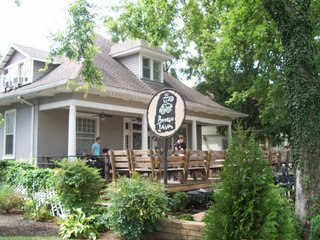 Reflecting back, I wouldn't mind having a place like Bongo Java or Fido around me, as long as I didn't have to incur the heavy Tennessee heat.